EN is excited to introduce a new six-part series from William Micklem on the need for breadth in eventing education, along with some thoughts on the breeding of event horses, plus a little added value from the inimitable Harry Potter! Here is Part I — enjoy! 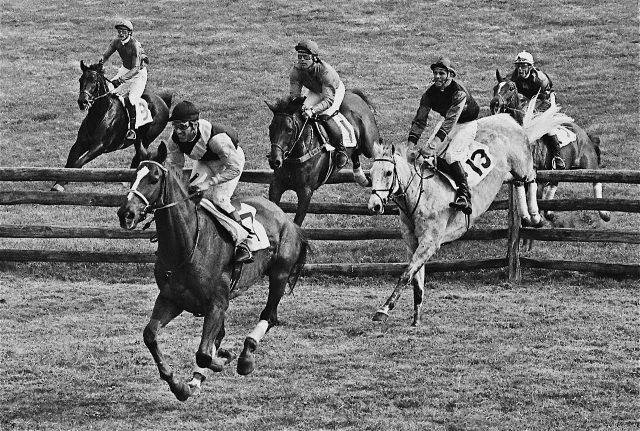 Breadth of experience for Olympic eventer Mike Plumb, on grey horse No 13, race riding over timber fences during the Maryland Grand National week in 1976. Photo credit: Douglas Lees. “Some wizards just like to boast that theirs are bigger and better than other people’s.” When reading this quote from Hermione, taken from Harry Potter and the Deathly Hallows, some might well be led astray in terms of understanding what she is talking about! Context is everything, and it all becomes clear when we know that Hermione is talking about wands. A lighthearted example I know, but the same applies to horses about context and has heavyweight implications. For example students are told they need to develop a horse athletically, and the immediate understanding is simply to do the equivalent of putting a horse in a gym. But everything becomes clear when we understand the full context of working with an animal, and the impossibility of separating the physical and the mental. So we can’t just go to the gym. Instead we have to first develop tranquility, and trust, and understanding, and willingness, and ride out over varied terrain and introduce the horse to a wider world … and they should learn this as young horses. Or students are told to develop a horse’s jumping ability for a 1.20m fence and a course of fences of this size, and the immediate understanding is to establish a 12-foot stride and use progressive exercises to achieve this in a flat arena, and then present the horse with a perfect take off points. But everything becomes clearer when we understand the full context of the wider needs of an event horse. They can’t just do this, as an event horse must learn to cope with jumping up and down hills, and with different speeds and stride lengths, and through mud and water, and be able to cope with getting close and far away from fences on take off, and a rider that makes mistakes at times and cannot fully control all the variable factors … and they should learn this as young horses. So Ernest did just that and became a hugely successful coach as a result. The Colonel was right … and very wise. Riders, trainers and coaches are going to be better at their jobs if they have a wide equestrian context from which to draw their expertise and stories. In addition if we want our riders and horses to fulfil their potential we need to continually work to be more efficient in training and competition. The key to this is to combine the work for the dressage, show jumping and cross country into one integrated programme. This is why it is important to find a coach who understands the context of the overall demands of horse trials or specialist coaches that have a good general background and are prepared to be part of an integrated coaching team. Does the same apply for riders? It is a fact that all coaching structures around the world demand a broad education at the lower coaching levels. A multi-discipline all round approach to rider education is considered essential before specialization, not just by me but also by such dressage and jumping luminaries as Reiner Klimke, Ferdi Eilberg, Bert de Némethy, George Morris, Jimmy Wofford, Bruce Davidson, Denny Emerson and John Ledingham. This is yet another reason why eventing has special value because it is the foundation of coach training for all equestrian disciplines. However, it is no longer fashionable for our riders to have a broad education. Cost and lack of time are two of the main factors cited as reasons for this, but probably the biggest factor is simply that people have forgotten how advantageous it is to have both a breadth and depth of education. But in the era of Jack Le Goff and the USA Event Team’s greatest success it was different, with riders such as Mike Plumb,Bruce Davidson and Jimmy Wofford all race riding, hunting and starting numerous young horses, and generally having a broader riding education. Mike Plumb was even second in the Maryland Hunt Cup in 1976, almost emulating his father who won in 1929. There are even some riders who have ridden international in more than one discipline at a very high level level. This role call of versatile riders is headed by a group including Ireland’s Tommy Brennan (show jumping and eventing); Germany’s Fritz Ligges (eventing and show jumping) and Reiner Klimke (eventing, show jumping and dressage), and Reiner’s daughter Ingrid (eventing and dressage); New Zealand’s Mark Todd (eventing, show jumping); Spain’s Luis Alvarez-Cervera (show jumping and eventing); Britain’s Chris Bartle (dressage and eventing), Sweden’s Peder Fredricson (eventing and show jumping) and Germany’s Michael Jung (eventing and show jumping). The extraordinary caliber of these riders says something very important about their achievement and suggests that emulating these riders may be one of the most worthwhile challenges for any rider. There are those who say that standards have risen and today this is not possible, but surely that in itself is a huge incentive for the great riders of the future. Marilyn Little in particular has successfully gone some way down this route with show jumping and eventing, and Doug Payne and Clark Montgomery are both currently dipping their toe in this water. While in Ireland we have one exceptional young rider, Cathal Daniels, who can do both at the highest young rider level. Sadly the one USA rider who could have ridden successfully in both championship eventing and show jumping is now retired through injury …and that is Karen O’Connor. If only a magic wand could be waved! Then the world wide equestrian audience would fully understand the full context of the different challenges faced by event riders and their horses, as a result of the three disciplines … they would then understand the brilliance of those that do it well. They would be able to see clearly that the multiple skills the riders possess, combined with the mental and physical strengths required by their horses, makes eventing the premier discipline. The breadth of skills on show is awe-inspiring, and their depth of ability in each phase worthy of the greatest praise, explanation and marketing. We don’t actually need a magic wand, just more belief in our sport, more belief in the value of a wider education, and then more energy and enthusiasm to sell our message! Part 2 – Five who were brave enough to stretch the boundaries.